After the Antifa group "Smash Racism DC" showed up outside the home of Fox News' Tucker Carlson on Wednesday night, one of the participants decided to give us their side of the story. About a dozen protesters visited Tucker Carlson’s home Wednesday evening with signs, a megaphone, and a tambourine. The incident, video of which was taken offline shortly after being posted, has prompted an aisle-crossing outcry – fueled in part by Carlson’s own significant embellishments of what occurred while he wasn’t home. I was there for the entirety of the 10-minute demonstration, and can report in detail what actually happened. Video posted on LiveLeak shows portions of the event, which lasted less than 10 minutes. It also illustrates Carlson’s other embellishment — that one person was caught on a security video saying they wanted to return to his home with a pipe bomb. In fact, the person filming is heard saying “Pipe bombs! Synagogue victims!” as the speaker with the amplifying device wraps up their initial statement and begins to lead chants. Carlson’s show and broader media empire have long amplified the same flavors of xenophobic paranoia and white supremacist ideology believed to have motivated alleged so-called “MAGAbomber” Cesar Sayoc and Pittsburgh synagogue shooter Robert Bowers. There is no mention of the phrase “pipe bombs” in the police report later filed. A few minutes later, one member of the group mounted the steps again and leaned a poster board sign on the Carlsons’ front door before rejoining the group. The sign had Carlson’s name and address on it. A handful of cars passed in either direction, most without stopping. One woman stopped to sarcastically congratulate the group on their tactics, then drove along. Moments later a second driver stopped, and seemed to grow annoyed when one of the legal observers standing to my left across the street from the house wouldn’t answer his questions. He then pulled forward and exchanged words with a second observer before driving on. The second observer crossed the street to say something to the small group of chanting protesters, who soon after began to amble back the way they’d come. “We’ll be back! We won’t tell you when!” the group chanted as it moved away from the house. Those carrying signs left them in the front yard bushes and other benign locations on the front of the property as they went. One straggler from the group then stopped, put a backpack on the ground, and retrieved a can of spray paint from it. As that straggler began to graffiti the anarchist A symbol on the Carlsons’ driveway, at least two members of the group walking away expressed dismay with their fellow traveler. “I didn’t sign up for this,” said one. “Seriously, what the f*ck,” said another. A Metropolitan Police Department squad car rolled up the street from the south as the tagger, clad in black and face not visible, finished up the symbol. The first responding officers briefly interacted with the slowly departing protesters, then doubled back to the house to check on the occupants. The group proceeded back down the winding, hilly street alone, at the slow pace required by the two in their number who were leaning on canes as they walked. I followed in a car. As the group walked, the man in the SUV who’d stopped to ask the legal observers what was happening appeared again and stopped to check in with the officers before continuing on in his car. Noticing the group walking in front of him, he cut the wheel to make a K-turn in a driveway and raced back toward the Carlsons’ house and the officers there. Moments later, three squad cars pulled up alongside the demonstrators as they neared an intersection and activated their roof lights. One officer, who provided his badge number when a demonstrator asked for it, seemed to be asking who had done the graffiti. “Bet if I grabbed one of you guys,” he said, trailing off but apparently referring to the alternative method he had in mind for identifying the vandal absent cooperation from the others. “Why don’t you guys keep going. Keep on moving,” he said then. As the group reached the main road, the same neighbor passed again, on a third loop of the neighborhood, this time holding up his own cell phone to film the faces of the people he passed. The protesters paused briefly at the intersection to turn their backs to the street and cover their faces – a tactic common in left political activism these days, in light of their political opponents’ habit of “doxing” and threatening participants in demonstrations that directly push the line between First Amendment activity and conduct law enforcement treats as criminal. The police incident report describes a “suspected hate crime,” but does not specify whether the police are seeking the person who graffitied the driveway or intend to hang charges on everyone present. Local law enforcement recently tried to bury hundreds of protesters with felony charges after a handful in their number broke shop windows and sparred with officers on Inauguration Day 2017, but the thin and unprecedented charges fell apart in court. That episode illustrates a willingness to overcharge protesters associated with anti-fascist tactics regardless of their individual conduct. It was also an embarrassment for local police and prosecutors, who might relish another chance to go after leftist activists having failed to land the so-called J20 cases. But the person leading the group’s chants began the demonstration by saying Carlson promotes “an ideology that’s led to thousands of people dying by the hand of the police, to trans women being murdered in the street.” Subsequent chants specifically referenced the migrant caravan that Carlson and other media figures obsessed over, and which was President Donald Trump’s closing political argument in the midterms. The group elaborated on its intentions in a written statement shared with ThinkProgress. The statement recounts the Sayoc mailbombing campaign, the Pittsburgh synagogue massacre, and the recent murder of two black people by a white man at a Kentucky grocery store. Carlson almost immediately received expressions of sympathy and support from a wide range of prominent media peers, from former Fox colleague Megyn Kelly to media reporter Brian Stelter to latenight host Stephen Colbert to fringe figures from sites like Gateway Pundit and Infowars. Bell isn’t alone in being targeted by Carlson in exactly the way everyone seems to agree he himself shouldn’t have been this week. Matt Rivitz, founder of the political boycotting coordination organization Sleeping Giants, told ThinkProgress he blames the Carlson-founded website The Daily Caller and peer publication Breitbart for a raft of specific and violent threats this summer against him, his wife, and his children. “The Daily Caller decided to publish my name and my wife’s name and my friends’ names and where I used to work and all that stuff,” Rivitiz told me. Commenters at the Caller and on a related story at Breitbart quickly doxxed him and encouraged each other to go after the Rivitz family, he said. Despite his immediately reporting the doxxing to the sites, Rivitz said days passed before either site deleted the flagged comments. The site did not immediately return a call for comment. Rivitz said he abhors the targeting of Carlson’s home by protesters and finds the tactic disgusting no matter who is targeted. 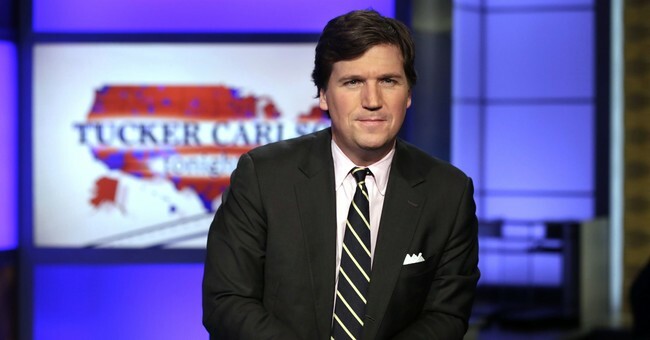 But the defense of Carlson this week has frustrated him, he said, because those speaking out against the tactic now have generally not said a word about the Caller’s facilitation of conservative harassment and threats to the Rivitzes. Right-wing media have characterized Wednesday’s group of fewer than 15 activists shadowed by four legal observers as a violent mob. In reality, a small group knocked on Carlson’s door, shook a tambourine, and chanted slogans aimed at his chosen career hyping hateful speech aimed at racial minorities and political opponents, then left. As one of them broke off to spray paint his driveway, two others angrily reproached that person. Police opted not to arrest anyone in the group, choosing instead to scold them for their ill-mannered behavior and send them on their way. The point of these direct actions, the activists behind them consistently say, is to deliver an emotional counterpunch to bad actors in U.S. politics whose work raises threat levels for marginalized communities. The point, in other words, is to unsettle and frighten — and I certainly would have been frightened had it been me in that house. But in both embellishing the nature of the threat and papering over Carlson’s own record, the media reaction has blurred the truth of Wednesday night’s events. What this guy is saying is that the protestors who showed up outside of Carlson's home were "peaceful." If that was the case then they wouldn't show up at night, when Carlson was set to do his show and some wouldn't deface private property. If they were trying to be peaceful then why did the group post Carlson's address on Twitter in hopes that others would show up? The most shocking thing is that the author admits that he would be scared if he was home alone. If his group was so peaceful and doing nothing but demonstrating then why would Carlson's wife need to be fearful?